Nick Boston from Classical Notes spoke with the director of Lumen Chamber Choir, Benjamin Thiele-Long. November 29th, 2018. Reproduced from Classical Notes website. 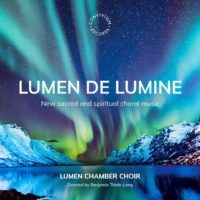 Recently I spoke to Benjamin Thiele-Long, Director of the London-based Lumen Chamber Choir, about their innovative project to record a whole disc of new sacred and spiritual choral music. Thiele-Long spoke about the inspiration that came to him on a visit to Iceland, seeing the Northern Lights for the first time. He compared his emotional reaction to when he first heard Howell’s Collegium Regale, and this led him to think about how to create new opportunities for choral music to move and excite audiences. In Iceland, he experienced a genuine enthusiasm for new music, and this was something he wanted to encourage back home. The idea for a project with the Lumen Chamber Choir was thus formed. This was in essence to create a platform that composers of choral music wouldn’t otherwise have, and to expand the repertoire of new music available to choirs of all abilities. They decided to launch a crowdfunding initiative, which proved successful, and approached various record labels to support the project. Thiele-Long says that Convivium Records were immediately supportive of the project, and instrumental in bringing the recording to fruition. The composers were found through recommendation, friends and some already associated with the choir as singers or former singers, as well as a successful social media campaign – Thiele-Long’s ‘day job’ PR background coming in handy here. They ended up with a good number of composers interested, and the selection process that followed, including the aim for a balance of styles, and demographic backgrounds, helped them reduce the chosen number of composers down to the final line-up. The end result is a collection of music from 12 different composers, with a very broad range of styles.